Do you play the most hot and frustrating game in your phone? Yes, I am talking about the flappy bird. This is the game that made me sick and bit rude. I will say it more frustrating than enjoyment. If you are also the victim of flappy bird then you are in the right place. In this post I am going to talk about some cheats and methods of making high score in flappy bird. I will also talk about some new challenges in flappy bird and alternatives of flappy bird. Dong Nguyen the developer of flappy bird had made some discrimination and this discrimination can be felt when you play flappy bird in ios and android. We can clearly feel the difference that in android the flappy bird is comparatively more easier than ios. So the android user you have great chance to score more. 1. Put the volume off while playing flappy bird because sound may distract you a lot. 2. Put your phone in flight mode because nothing will be frustrating than having a call or message while playing flappy bird. 3. Shut your doors and windows and make yourself isolated for a moment while playing flappy bird. 4. Heed your tapping on screen and also learn to response soon. 5. While playing flappy bird you need to tap the screen in a rhythm and whenever there are high pipes tap quickly to reach the height of the pipes. Never tap twice when you are in between the pipes at the center. So that you can avoid those terrific bang. 6. Whenever you got tired and feel like what a rubbish then go for a break, have some coffee or your snacks do some other job or play the game you like and then return for the battle with the flappy bird. 7. The final tip is that you need to be cool and determined. I hope you score better with this tips. If you are already a good scorer and fade up with flappy bird then you need to try something new. 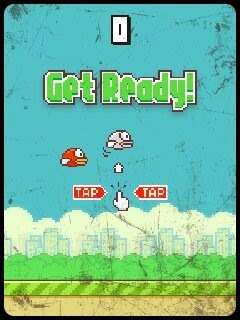 Since there are no stages in flappy bird you may get bored with the same stage. So what you can try for different. No need to do anything fancy, just make your phone upside down and play I ensure you will feel as same as you felt at first dealing with flappy bird. What can be the best alternative of flappy bird? Well in this question I must say clumpsy bird you can find it in playstore but I am not sure about ios. Likewise clumpsy bird is bit more frustrating than flappy bird and you can find the gap between the pipes bit smaller than that of flappy bird and also you need to play clumpsy bird horizontally which make it more difficult. So guys these were some tips to score higher in flappy bird. Hope you can make it. Best of luck.